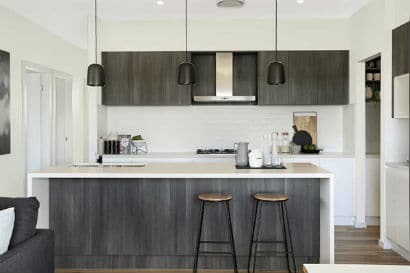 At the 2017 Master Builders Association Excellence in Regional Building Awards for the South East Region, this display home was awarded the Best Display Home in the $300,000 – $400,000 range. You really have to come see what the fuss is about! Positioned on a 15m x 30m corner block, the “Oakwood” can be modified for a sloping site with a split-level option. Boasting open plan kitchen, family & dining areas that flow seamlessly onto the adjoining rear alfresco, this design enjoys a natural transition between indoor and outdoor living spaces. The award winning design also features four generously sized bedrooms with a deluxe ensuite bathroom to the master and cleverly designed walk-in-robes, whilst all other bedrooms feature built-in-robes. In addition to the spacious, open living areas in the Oakwood, there is a home theatre and a children’s activity area, ensuring everyone has a living space to call their own. Download the Calderwood Valley Brochure for detailed information about Ridgewood and Oakwood house designs, as well as other home design options that are suitable for the Calderwood Valley. The brochure features 3D renderings, detailed floor plan information and design feature information. Why not come visit Mincove Homes Calderwood display homes for yourself? They are open 7 days a week, between 10 am and 5 pm.